The B5HP rotary screw compressor is a heavy-duty, high-performance & high-efficiency Rotary Screw Air Compressors operating at a 100% duty cycle and is ideal for continuous-use applications. It will provide reliable, dry, clean compressed air is whenever it is required. Innovative component integration results in a compact, quiet air system engineered for efficiency & performance; providing high-capacity air delivery and stable system pressure with minimal installation space. 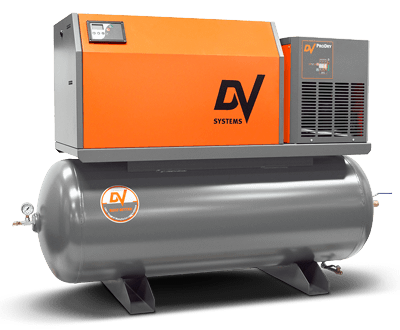 These compressors are available in both tank mount with or without a refrigerated air dryer, and a compact base mount unit that can be fed directly into your current compressors air receiver. With a footprint of only 21″ by 34″ it is a perfect choice for compact installations.